The Dovecot folders are in each user's ~/Mail/Dovecot folder, so if you did an upgrade to OS X Lion, they should still be there. On the other hand, if you didn't do a clean install, there will be cruft left over from the previous installations of MailServe. So, if you've open MailServe for Lion, save the current config from the File menu, do a De-Install from Help menu and then quit and come back to the app, and open the saved config. Then start all the services you need. You'll get the new binaries, config files, libraries and the other stuff that will work with Lion. 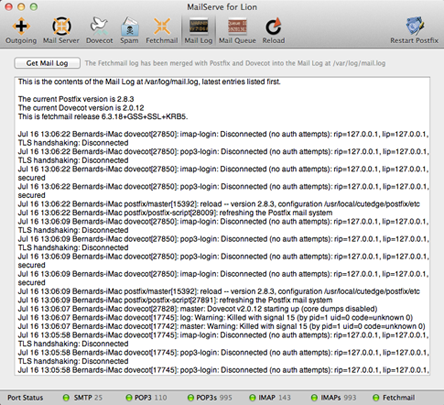 MailServe for Lion includes new binaries and config files that are specific to Mac OS X Lion. You can do a de-install to clear the files left over from the previous Leopard/Snow Leopard versions of MailServe. First, save the current configuration using the File->Save menu. Then, quit and come back into MailServe. Then, open the saved configuration file to read back the previous configuration settings. Then, Start Postfix. You will get all the new binaries loaded for use with Lion. The Help menu also contains links to this MailServe for Lion web page and they can be used to check our web site for new versions. 5.0 July 14 2011. 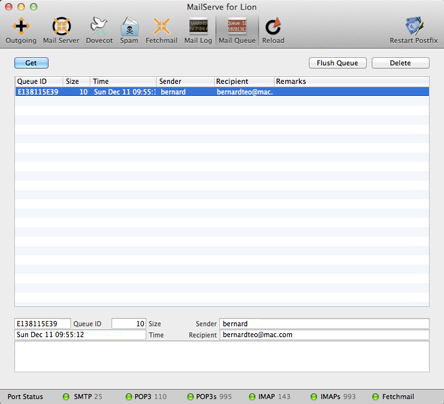 MailServe for Lion released with version 2.0.12 of Dovecot. 5.0.1 July 24 2011. Updated Dovecot to the latest current 2.0.13. Fixed two problems with Dovecot. Dovecot can now allow SSL ports (995 and 993) to be opened without requiring the corresponding default ports (110 and 143) to be opened, too (so that you can force a user to connect to Dovecot only via SSL). Also, restored Dovecot's ability to support custom port numbers for POP and IMAP. Please remember to save your config, do a de-install from MailServe's Help menu, re-open the saved config, and then restart all the services, in order to get these latest Dovecot binaries. 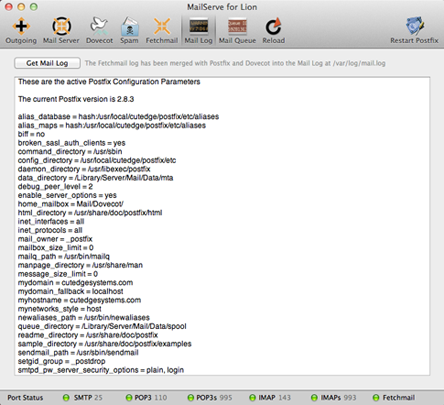 MailServe for Lion 5.0.1 includes a new version 2.0.13 build of Dovecot. If you've used the first version 5.0, please do a de-install from the Help menu on 5.0.1 to get the latest Dovecot.